Step 4. Scroll down to the page you wish to extract. Step 5. Click the "Save Page (PDF)" button under the Pages tab in the PDF Converter toolbar. Step 6. Confirm the Save of the page. 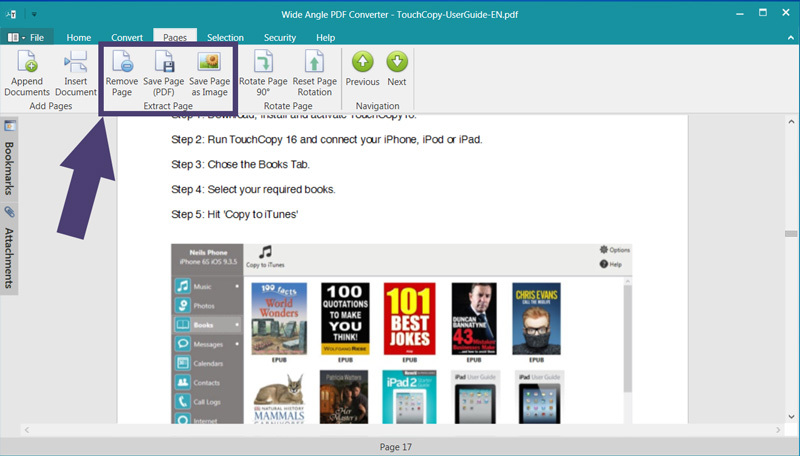 If you only need to save or extract a single page from PDF, you can extract this page using PDF Converter. Navigate to the page which you would like to extract, and click Save Page (PDF) from the Pages tab in the toolbar. In this way, you can split a PDF document into individual pages. As well as allowing you to extract pages from PDF, you also have the option to save the page as an image file. To do this, find the page which you'd like to save from the PDF file, then click Save Page as Image. Delete pages from PDF files >.